Recently, Kim Kardashian West spoke with Us Weekly, and the interview was much ado about beauty. We learned that Kardashian West’s father, famed attorney Robert Kardashian, is responsible for her obsession with makeup and that mom Kris Jenner has had the same facialist since she was 17 years old (um, was everyone getting facials at 17 without us?). But it was Kardashian West’s daughter, 4-year-old North West, who stole the interview. Kardashian West explained that sometimes, getting little Northie in the school spirit can be a chore. Her solution? Bribery, of course. Makeup bribery, that is. More: Is Kim Kardashian West Considering Surrogacy as an Option for a Third Child? Though considering North’s age — and how many tots have a tendency to smear makeup everywhere — Kardashian West added a sensible caveat: Said bribery is all make-believe. “I’ll put on fake makeup,” she explains. “And she won’t know, because she’s not looking in the mirror, but she thinks it’s all on her face, and we’ll be driving to school, and she’ll say, ‘Mom, do I still have it on?’ And I’m like, ‘Yes, you sure do,'” she said. Mama Kimmy’s KKW makeup brand is a total cash cow, BTW. Earlier this year, her new line sold out in three hours and earned her $14 million dollars. With so much access, how could North not be inspired? 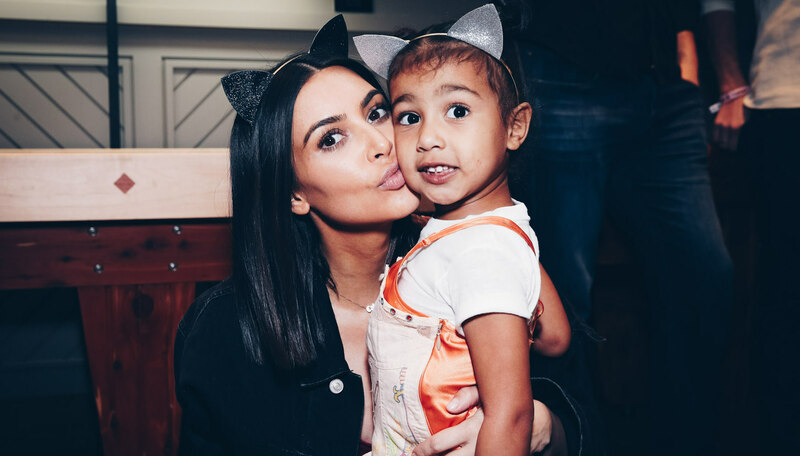 Earlier this month, Kardashian West explained that North has already turned into quite the makeup maven herself. “The other day, it was so funny,” Kardashian West recounted. “My daughter watches so many YouTube tutorials and videos. She was unboxing the My Little Pony Colourpop collection, and I thought to myself, ‘I wish I was recording this’ because her reaction was so funny. And then she did makeup on the My Little Pony that they gave and she said, ‘Mom, I want to do a YouTube video,’” Kardashian West told WWD (also as reported by People). However, North’s papa wasn’t feeling that idea; Kanye West put the kibosh on kiddo’s plans of YouTube stardom… for now.